July 4th 2011. 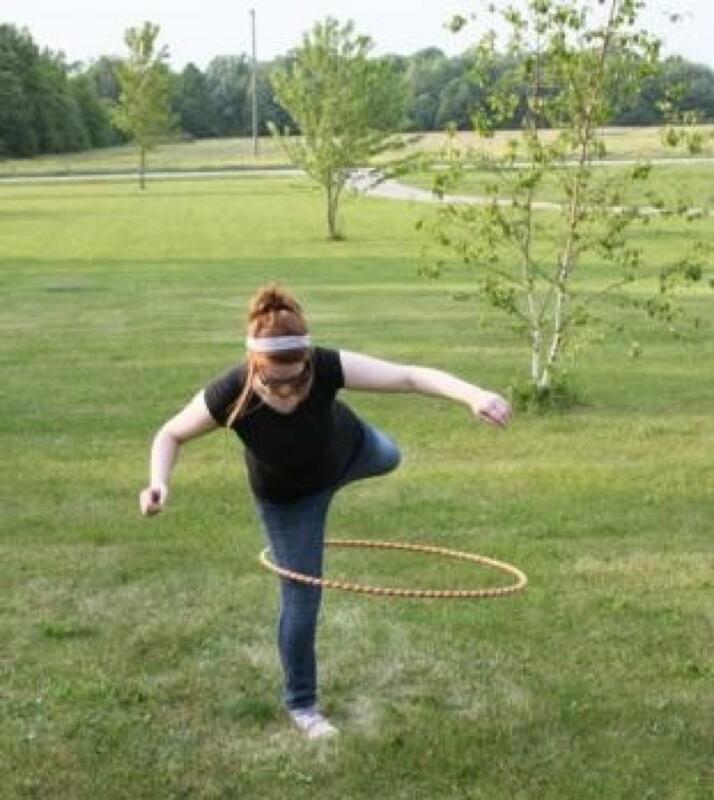 This was the day I first started hooping. My sister, Ginger Mandy, had just returned from LA. 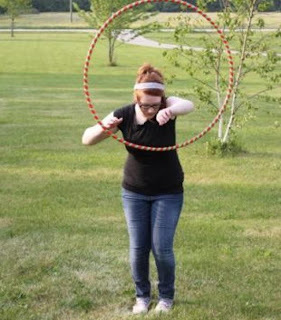 With her she brought home (at that time, home = BFE with my mum) 2 hoopnotica fitness hoops. I was 230 pounds. I had previously lost about 20-30 pounds in result of no car while living in the city. 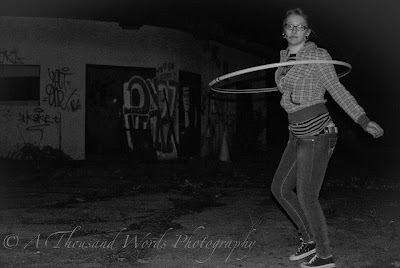 These hoops were heavy, large in diameter, and perfect. I could hoop from waist to hips, do a 360 spin, and attempted a halo duck in. The following day, we hit up home depot and target for hoop tubing/supplies and duct tape to make our own. 3/4" 160 psi HDPE tubing. Mine was decked out in Hello Kitty tape, my sisters leopard print. Once done, outside we went. With my sisters laptop for music, of course. Coza Frenzy on repeat, other bassnectar occasionally, and our hoops. At the time I was jobless living with my ex in an apartment Downriver. Alone, I'd spend hours YouTube searching tutorials, performances, and made playlists. As I'd visit my mum's, to the backyard as usual my sister and I went. Some days we'd use the living room. No longer allowed, as it scares our senior pup Oliver....The wall happens to have skid marks, which may contribute as well. My confidence dropped as I saw she would progress faster. She started first, but I couldn't help but feel envious. It felt impossible. Me....have the ability to progress? The amount of other hoopers is outrageous. It felt pointless. Me...one day performing? Patience took place of procrastination Tricks became easier and easier. 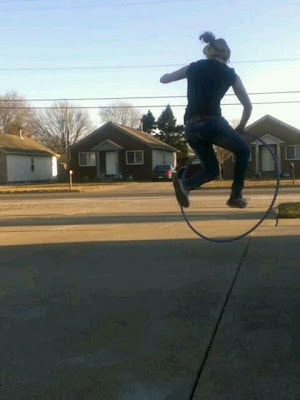 The vortex, chest hooping, knee hooping, isolation (took the longest aside from shoulder hooping). Before I knew it, my one year hoopiversary hit. Looking back, I can't believe the amount I've progressed. Lost 80 pounds, gained a lifetime source of happiness. Winter 2012 I hit downtown Detroit with my neighbors who lived in mid-town. At night, adventured the city along with our hoops. People became curious, wanted to try, asked how. I was teaching others a skill left behind in one's childhood. 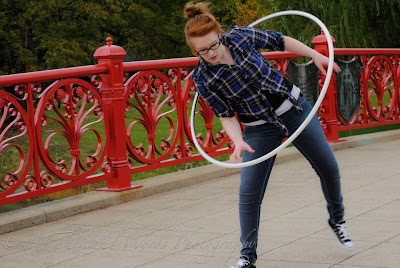 People asked where to purchase such hoops, too bad I had no business cards. 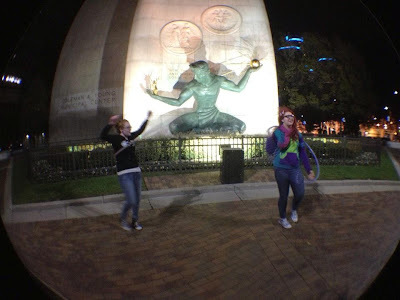 During our adventure, as we went to turn a corner a crowd of clubbers surrounded us. Out stepped a Guy dressed in 70's attire. Chants began. "Hoop-off! Hoop-off!". 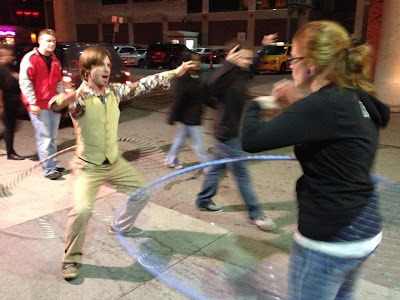 We had ourselves a hoop-off, and they disappeared just as casually as approaching. I was tipped by a hot blonde, never going to forget that. A car filled with guys chanted. Then began yelling "TAKE YOUR SHIRT OFF!". Instead I flipped them off. Near the end of 2012 my friend and I took a visit to Belle Isle for a hooping photo-shoot. Windy, cold, but worth it. Before leaving I finally convinced her to go into the abandoned zoo with me. No ghost penguins attacked, but a vintage baby carriage was casually placed where vicious beasts once lived. By the water is an amazing view of Downtown Detroit. A nice lady saw my LED hoop troubles, and gave us glow sticks. I'm glad to be friends with such an amazing photographer. Winter 2013 I lived with my Aunt. I'd use her basement daily to stretch, dance, and hoop. Music selection included Eminem's first 2 CD's, Janis Joplin, or the Cure. I now live with my boyfriend, his dad, and his 91-year-old Italian grandmother. The weather is nice, and my neighbor/hoop buddy and I dance outside together. It's currently June of 2013. I officially lost 100 pounds hooping. 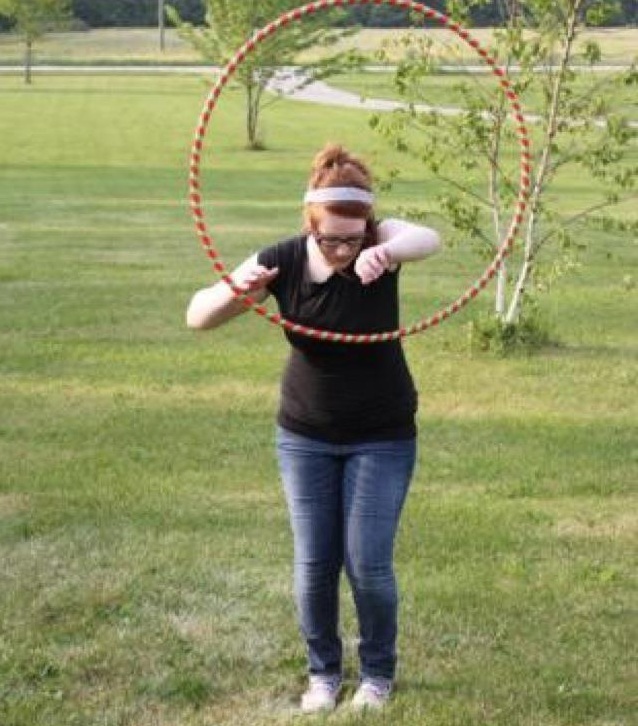 My 2 year hoopiversary is next month, and I can't believe how much I've progressed. Not to mention, with my homemade hoops. This July maybe I'll celebrate by purchasing myself a nice hoop. Any suggestions as to advanced hoop suppliers is greatly appreciated.